Cody McFarland, left, and Courtney Roberts, both of Gorham, look over a bass pulled from Otter Ponds by Tyler Allen of Gorham. The pond also has been yielding trout. Above, Mark Morrill of Gorham prepares to match wits with whatever’s swimming under the thick ice at Otter Ponds in Standish last Friday. 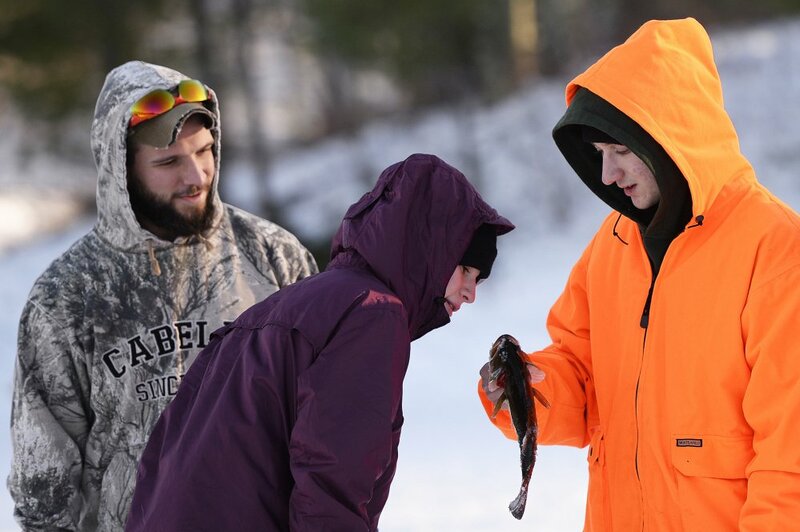 Below, Cody McFarland, left, and Courtney Roberts, both of Gorham, look over a bass pulled from Otter Ponds by Tyler Allen of Gorham. The pond also has been yielding trout.